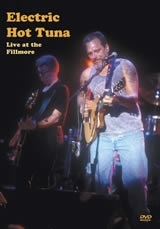 Following up on the previous Sweetwater production with Hot Tuna, the Octalouie team decided to create another production with their friends Hot Tuna as they returned for a special homecoming at the Filmore Auditorium in San Francisco. Just as Chuck Berry, Elvis Presley. Little Richard, and countless others put the spin on blues music to create rock and roll, Hot Tuna returned the favor, going electric for this very special show. Like the Sweetwater program, this program is also available on DVD. 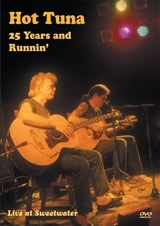 Many years before MTV utilized the “Unplugged” formula to showcase musical acts in acoustic settings, Jorma Kaukonen and Jack Casady travelled a similar path, diverging from their respective roles in the Jefferson Airplane group to create an acoustic alternative that would be known as Hot Tuna. Exploring a twenty-five year legacy, this concert documentary is the first of two programs to focus on Hot Tuna, using the intimate Sweetwater Saloon of Mill Valley, California as a backdrop for their story. Octalouie director Jesse Block created this program back in 1992, utliizing Octalouie partner Eric Predoehl on handheld camera for this intimate portrait. Produced in conjunction with San Francisco’s PBS affiliate station KQED, this program is widely available on DVD, VHS, 8-track, Super8 and zoetrope.